Experience a deep sea excursion of a lifetime by taking a chance on Greentube's new Tidal Riches slot. Greentube casino software has created an entertaining summer slot featuring cascading symbols, loads of ground-breaking bonus attributes and generous rewards. This online game possesses all the ingredients of a great slot and is bound to become a favorite during the course of the year. Enjoy an island paradise adventure while you bask in the sun, unwind in the waves and enjoy an unforgettable deep sea adventure. While you at it, dive to the bottom of the deep blue sea and discover your fortune in the new Tidal Riches slot featuring 5 reels and 20 paylines. Instead of the usual 5x3 layout, the creators of the new Tidal Riches slot have opted for cascading symbols. However, players can still anticipate lucrative payouts as well as an excellent gaming encounter. Players can expect to find ground-breaking graphics blended with crisp animations in the new Tidal Riches slot. On the reels, players will find both low and high payout symbols. The low payout symbols are represented by the 10, J, Q, K, and A card symbols, while the high payout symbols are represented by the pufferfish, angelfish, red octopuses, sea turtles, and dolphins. The size of your bet can be adjusted to suit your style of play and vary between 0.20 up until 100 credits per spin. This new game is about to give slot enthusiasts the prospect to win a fortune with its state-of-the-art bonus features. Players can expect wild substitutions, a Hi-Roller mode, and an Arrow Trail that leads to free spins with additional Treasure Chests which reveal a regular pay symbol when landing on the reels. Furthermore, the wild symbol can replace any other symbol to reach your goal. Players will also be awarded an extra active payline for every achievement while at the same time starting an Arrow Trail that assists to increase 'the active playing field. During the Arrow Trail, each winning spin will ignite an arrow. The Arrows Trails feature activates five free games alongside treasure chest symbols that enhance your winning potential. Landing up four, five, six or seven Arrow Trails will reward the player with four, six, eight or ten free games. 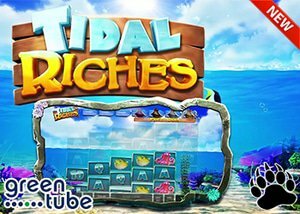 If you are ready to put on your scuba gear and dive into the depths of the sea to find hidden treasures in the new Tidal Riches slot, then you can visit your favourite Greentube casino today. We encourage you to check out Interwetten Online Casino where you'll receive a 50% match up to $200 on your first deposit. Ts and Cs apply.